Florida evacuations ahead of Hurricane Irma causing highway gridlock. 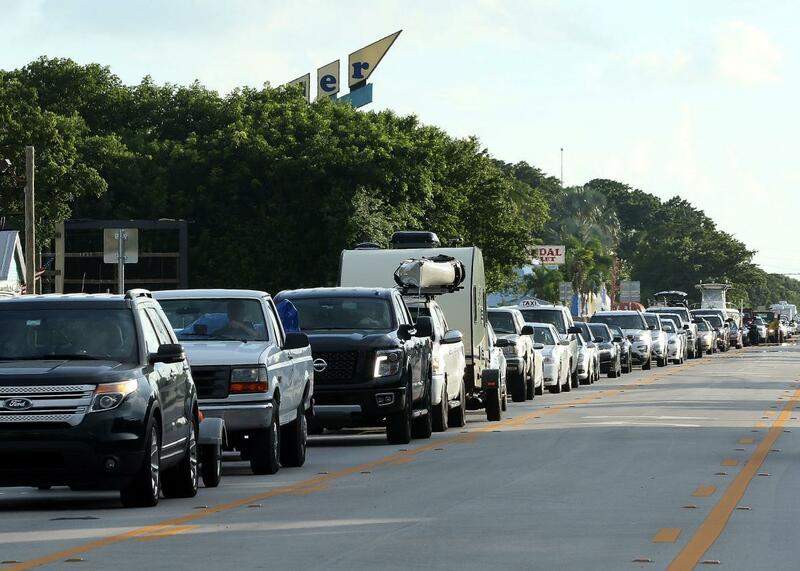 A steady stream of traffic heads north on Overseas Highway as mandatory evacuations continue in Monroe County. This post has been updated as news develops. With Hurricane Irma expected to make landfall and devastate Florida’s east coast on Sunday, tens of thousands of people are attempting to leave the area through northbound highways, causing severe gridlock. The Florida Turnpike and Interstates 95 and 75, the main roads out of the state, have been jammed throughout the week. Traffic counts were tripled in certain areas on Wednesday, quadrupled on Thursday, and expected to get worse on Friday. Highway officials are now allowing drivers to use shoulder lanes to ease some of the congestion, but have not yet switched any highways to one-way traffic, because vehicles still need southbound routes to bring supplies and gas to shelters. Fuel shortages are causing hours-long lines at gas stations. The highway patrol has been escorting supply tankers to refueling sites in order to accommodate the growing demand. Mandatory evacuations have been issued for over half a million people in high-risk areas of Miami-Dade, Broward, Palm Beach, Brevard, and Monroe counties, contributing to crowding of the roadways. Gov. Rick Scott will likely announce even more evacuations on Friday. In preparation for Tropical Storm Harvey, Texas officials decided not to require anyone to evacuate because of traffic concerns. The National Hurricane Center downgraded Irma from a Category 5 to a Category 4 Friday morning, because its winds have slowed from 185 mph to 150 mph. However, the more recently formed Hurricane Jose was upgraded to Category 4 on Friday and is on track to hit the Caribbean islands Antigua, Barbuda, Anguilla, St. Martin, and St. Barthélemy, which are already heavily damaged by Irma’s impact earlier in the week. The death count from Irma on the islands has risen to at least 20 people, nine of whom were in the French Caribbean. Three were killed in Puerto Rico and four in the U.S. Virgin Islands. This number will likely continue to climb as first responders reach the worst-ravaged areas. Early on Friday the hurricane also hit the Turks and Caicos with 20-foot waves and scraped the northern coast of Cuba, where thousands of tourists have been evacuated. Irma is on its way through the Bahamas as of Friday afternoon.